NKM designs the CND series Conical Dryer based on our CSM series Conical Screw Mixer and RBM-V series Vertical Ribbon Blender. The Conical Dryer has the jacket built outside of the cone vessel for heating or cooling applications. It can be either heated by water, thermal oil, or steam. 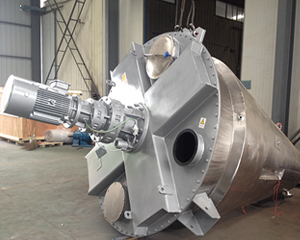 When deaeration processing is required, vacuum system is installed to maintain the vacuum inside the cone vessel. In this case the top is usually made of a dish head instead of flat cover to bear the pressure difference inside and outside of the cone. 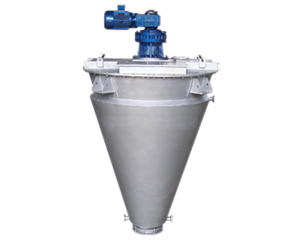 2) End products can be discharged completely without any residual in the conical container. 4) A variety of discharge arrangements are available by manual, pneumatic or electrical operation. 5) Contact part can be by carbon steel, SS304, SS316L, Titanium, Duplex stainless steel, Hastelloy and others. The CND series Conical Dryer has the same working principle as the CSM series Conical Screw Mixer or RBM-V series Vertical Ribbon Blender, and the material inside of the cone, which is moving all the way, is heated by the medium in the jacket.